Today is Veteran's Day in America. At 1030 this morning, in Arlington National Cemetery, the U.S. Navy Band will strike up, at 11, a wreath will be laid at the Tomb of the Unknown Soldier, and subsequently, there will be a ceremony in the Memorial Amphitheater. I will be in Arlington, to place a pebble on my father's grave, and so will Dr. Lester Tenney. Tank Radio Operator Lester I. Tenney, Company B, 192nd Tank Battalion, Illinois National guard out of Maywood, Illinois. Most recently stationed to Clark Field in 1941, most recently deployed to Lingayan Gulf, on the Bataan Peninsula, in 1942. Today in Arlington, Private Lester Tenney, the youngest son of Gus and Fannie Tenenberg of 1200 West Sherwin avenue, Chicago, holder of the Bronze Star, the Purple Heart, the Combat Infantryman's Badge, three Presidential Unit Citations, and the Prisoner of War Medal, the National Commander of the American Defenders of Bataan and Coregidor, one of the last survivors of the Bataan Death March, will represent that group for the 62nd consecutive time in the ceremonies. 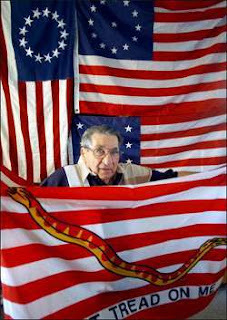 Tenney is 88 years old, and because he lied about his age in order to enlist, is one of the youngest members of the organization. There are less than a hundred left, and they have decided to disband. Tenney was one of the founders of the group, which fought for 63 years to obtain a simple apology from the Japanese. Unlike American POWs of Nazi Germany, who received both apology and restitution, the Bataan Death March survivors (most of whom were also sold into slavery) were neither compensated nor apologized to. Like many Americans, Lester Irwin Tenenberg (he changed his name to Tenney because that was his nickname in Camp 17) was the son of immigrants. In his case, Jewish immigrants from Germany. Like many former German Jews of that period, his bar mitzva, his Jewish coming of age (normally performed at the age of 13), was delayed by events, and forgotten about. Last Saturday, at sixteen thirty hours, at Ohev Shalom Talmud Torah Synagogue in Washington DC, I had the privilege of seeing him called to stand at the torah for the very first time. He was accompanied by his stepson and his grandson, and their families. In fact, it was a triple bar mitzva. 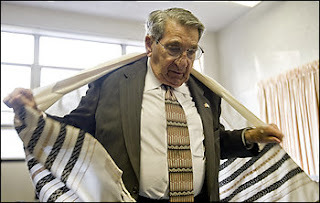 His stepson Donald Levi (65) and his grandson David levi (39) were called to the torah as well. It is traditional for the Bar Mitzva Boy to give a short talk on the portion of the torah which was read. In this case, as it would happen, it was Lech Lecha, in which God told Abraham to leave his native land and his father’s house in Ur Kasdim (in Sumaria, now Iraq) for a land that God would show him, and in which Abraham and his family began their long march to Canaan (now in Israel). It was a longer march than Lester's, but, as he pointed out, Abraham had food, water, rest, and his family around him. Nor did he lose his faith in the United States. "We were beaten and starved. We lost track of the time, and of the days, but we knew that one day, somehow, we would get home," he said. Tenney collects American flags. And he gives them to schools, veterans homes, and other organizations. "The reason we fight is for the love of our flag," Tenney said. "It's a big part of our history and lives have been lost over it. People need to know their history and I intend to tell them." "When I see our flag," he said, "it still moves me to tears."